There is a time for all things under the sun. There is a time to fish and time to remember. Memorial Day we remember. The Battle of Kamdesh occurred on October 3,2009 in the eastern part of Afghanistan. It is a footnote of a footnote in our history. 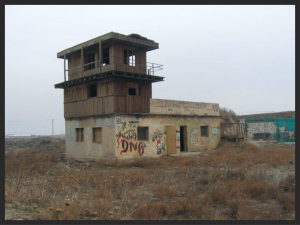 US Army Command Operating Post (COP) Keating was an isolated base in the Hindu Kush manned by 60 men from Bravo Troop, 3rd Squadron, 61st Cavalry Regiment of the 4th Infantry Division. The base was surrounded on three sides by the Hindu Kush Mountains. The Hindu Kush Mountains resemble the Teton Mountains in Wyoming with jagged peaks that erupt straight up from the valley floors inviolable as well as foreboding. The Afghan Nationals walked off their post in the early morning when 300 Taliban attacked COP Keating. 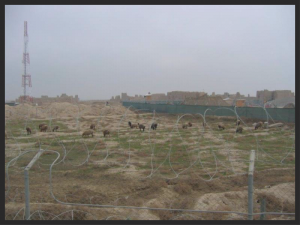 Twelve hours later the men from the 3-61 Cav pushed the Taliban back and off the post. Statistically: 150 Taliban dead, 8 Americans killed and 27 wounded. The soldiers were awarded 27 Purple Hearts, 37 Army Commendation Medals with “V” devices for valor, three Bronze Stars, 18 Bronze Stars with “V” devices, and nine Silver Stars. Staff Sgt. Clinton Romesha and Sgt. Ty Carter received the Medal of Honor. Forty eight hours after the battle the COP Keating was evacuated. On October 6 the outpost was bombed by a B-1 Air Force bomber to prevent looting for munitions. 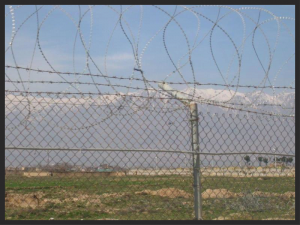 I arrived in Bagram Air Base a month after the Battle of Kamdesh. This photo is of Spc. 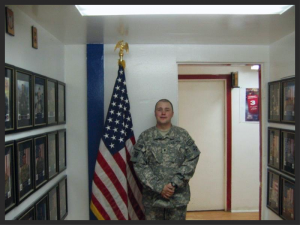 Cox a young man from Idaho who is in the hallway of the 4th ID in Camp Cherry Beasley. The men on the wall are from the 3-61 Cav who died on October 3,2009.